Discussion in 'Replica Props' started by wuher da brewer, May 1, 2006. This weekend there was a con. Like usual, it was an excuse to get together with local area prop collectors and hang out. We were still drinking and reminiscing at 5:00 am so you know it was a good time. My houseguests, Funky Jedi and Mostly Harmless gave this to me so I had to show it off. It's a Seburo M-5 from Ghost in the Shell. For those of you who don't know, Seburo is a fictional small arms manufacturer commonly found in many of the works of manga artist Masamune Shirow. He frequently attributes the Seburo name to advanced, high-velocity, small-caliber weapons. 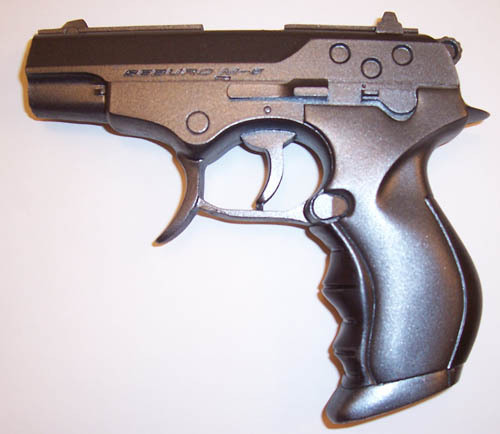 Seburo M5 is a medium-sized SA/DA handgun that fires 5.45 x 18 mm 7N7 cartridge used in the Russian PSM and OTs-23 pistols. M5 has an ambidextrous safety, and its magazine holds 20 rounds. 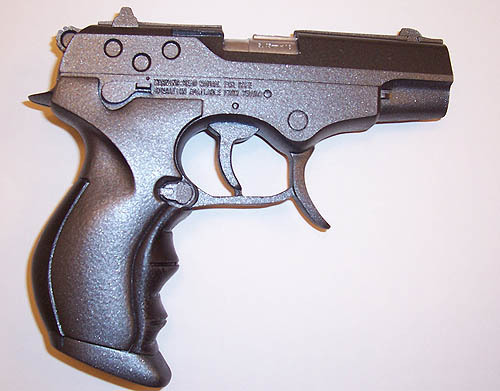 Official sidearm of Motoko, Saito, Boma and possibly Paz. :eek I'm a pretty big Shirow fan. That is a beautiful piece. Hey Funky. Where do us mere mortals get Shirow guns? Sorry for getting off topic... about those Shirow guns? I've got one of these too. Very cool piece. I'll have to get a pic of mine up. Even the grips are rubberized. I was really pleased the way this turned out, nothing but the best for my buddy Evan. I have a Seburo exPloder kit... would love to get an M-5. Still have to do my own. Saw this in a friend's collection online. Limited run? Still made?